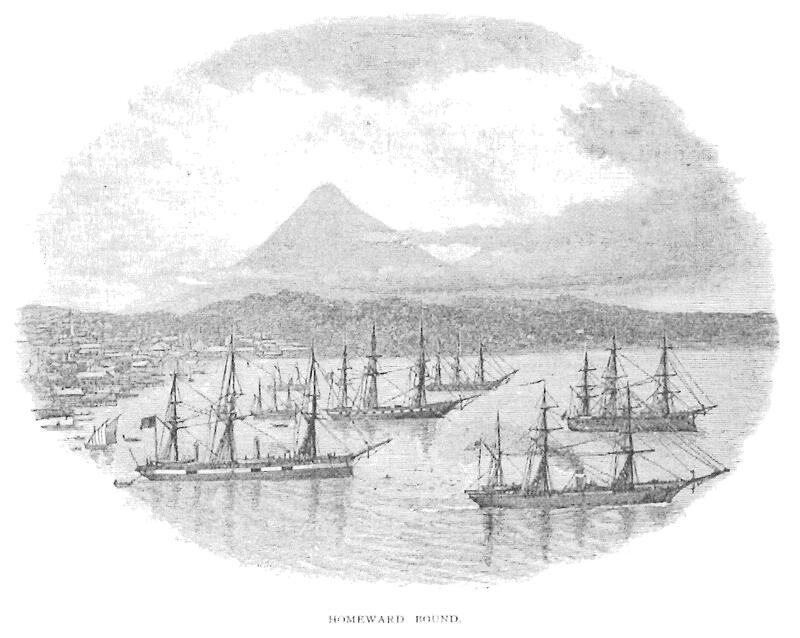 After a brief stop in Hong Kong, where the Navy rotated Captain Creighton home and placed Captain E. H. Williams in charge, Oneida returned to Japan. Only a typhoon marred the good weather Oneida enjoyed during her three years in the Orient. It destroyed two of her longboats, but otherwise did little damage. By November of 1869, she received orders to begin preparations for the return trip back to New York City, and the Navy dispatched her to Yokohama to have her boilers refitted. Captain Williams also tried to purchase replacement longboats, but they proved too expensive. He hoped to procure some in Hong Kong when Oneida stopped there on her way home. Her crew said last goodbyes to their friends aboard the various warships in Yokohama. The Ocean’s crew wished them an especially fond farewell, a shared battlefield experience made the two crews close. The Russian cruiser Vsadnick’s officers invited their counterparts aboard the Oneida to join them at a local photography studio; each crew hung a copy of the picture in their respective wardrooms. Frothingham gathered up some books to enjoy on the journey, including a volume of Confucius’ teachings. He’d also brought aboard a Japanese orphan, the son of a Samurai killed in the Boshin War. It took some doing to convince the boy’s guardians to allow him to educate the boy in New York City at Frothingham’s expense; but they had eventually relented. In addition to Frothingham’s ward several men from USS Idaho came aboard. Scheduled to depart the previous November, a typhoon caught Idaho when only one day out of Yokohama. Idaho managed to limp back to port, but she was no longer seaworthy. Those of her crew whose enlistments were schedule to return to the United States joined Oneida’s crew. Ensign Charles Copp was among the Idaho crew transferred to Oneida. Copp was tall and good looking, with a muscular build. He possessed an indomitable will; while working as a newsboy in his native Troy, New York, Copp successfully resisted his compatriots’ inducements to smoke, drink, and gamble. With the money he saved hawking newspapers, Copp left school at age 14, and moved to New York, taking a job as a clerk. Two years later, in the midst of the Civil War, Copp joined the Navy. He proved himself quickly, earned a promotion and his senior office Commander Joseph Miller’s recommendation to the U.S. Naval Academy. Although inclined to refuse, Copp found himself persuaded when Miller threatened to strip his promotion if he refused to take the entrance exam. Although Copp’s examination was lackluster at best, he found himself admitted. While faring poorly on the academic pursuits, Copp’s impressive build brought with it athletic achievement; Copp was a champion boxer, expert sportsmen, and earned high marks in practical seamanship. The consummate Christian gentlemen, Copp neither swore, used tobacco, nor drank. The beau ideal persona matched well with Copp’s willingness to defend his Naval Academy classmates when upperclassmen attempted to haze them; several fights resulted, which Copp won. After graduation, the Navy assigned Copp to USS Decatur, the Asiatic Squadron Flagship. In late 1869, the Navy ordered Copp to return home aboard Idaho to take the examination for promotion. After the typhoon disabled Idaho, Copp found himself aboard Oneida. Oneida’s executive officers, Lt. Commanders Muldaur and Stewart, oversaw departure preparations. Illness kept Williams ashore under the care of Frothingham’s superior, Doctor James Suddards. Williams did make an effort to find replacement longboats, they proved expensive, and headquarters ordered him to wait until the Oneida arrived in Hong Kong. At the last possible moment, Williams and Suddards boarded ship. The Oneida weighed anchor. Captain Williams conducted a brief inspection of the ship before Suddards sent him below decks to the cabin the Captain shared with his clerk, William Crowninshield. Williams barely managed to light a candle before sinking down into a sleeping chair. 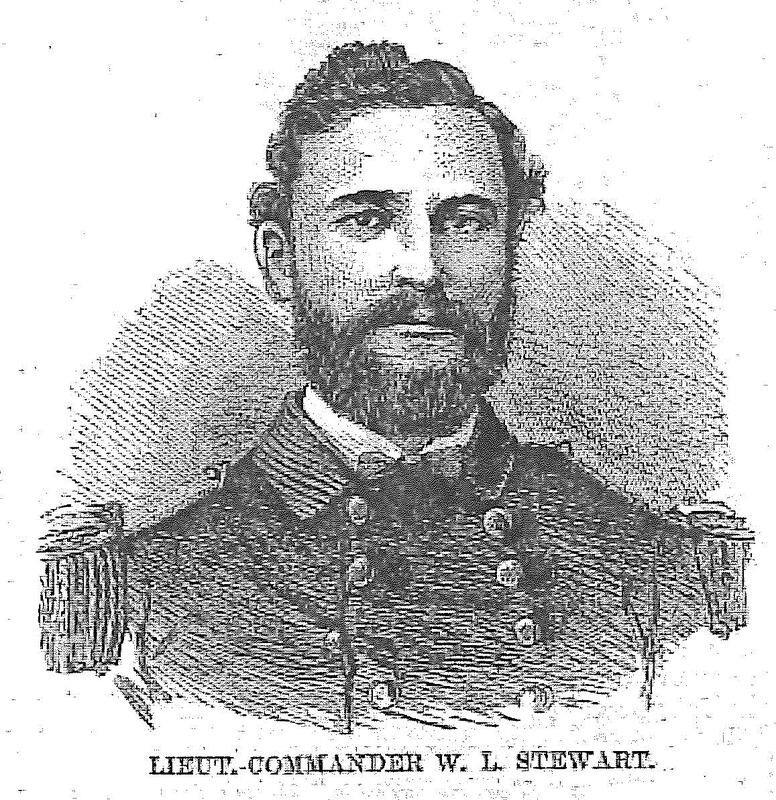 Stewart ordered sails set, arranged lookouts, and set the course south by east, one quarter east. Secured for sea, he turned the deck over to Master Isaac Yates. With the exception of those on duty, most of the officers and crew relaxed. Captain’s Clerk William Crowninshield lay down for a nap; he found a perch on the starboard transom and dozed. The officers made their way to the wardroom. In the absence of Captain Williams, Lt. Commander Stewart presided over the meal. Newcomers like Copp sat cheek by jowl with old Oneida hands such as Frothingham. Indeed, the men probably swapped stories of life in the Orient, or told tales of home, excited over the prospect of seeing loved ones left behind some three years before. Yates disturbed the ship’s officers at dinner to ask Lt. Commander Muldaur, the navigation officer, to verify Oneida’s course. Muldaur’s lone concern was the Saratoga Spit, a small piece of land jutting into Yokohama Bay from the East. If she kept to her present course, Oneida would be safe. Off to West, the distant lights of an approaching ship glimmered on the water, but Muldaur saw no need to worry. “That steamer will pass to the starboard of us,” he told Yates then headed back down to dinner. Yet, with each passing minute, the steamer drew closer. Her green starboard light could be seen clearly now, and in an profusion of caution, Yates ordered Oneida’s helm to starboard; turning the ship to port. He again called for Mulduar, who insisted Saratoga Spit posed a threat, not the approaching steamer. The bay was three and a half miles wide, more than enough room for both ships. Besides, Naval Rule 14 stated that if two ships saw each others’ green starboard lights, they were to remain well clear of each other by helming to starboard. Oneida already had helmed to starboard as far as was safe, were the distant steamer to do the same, all would be well. 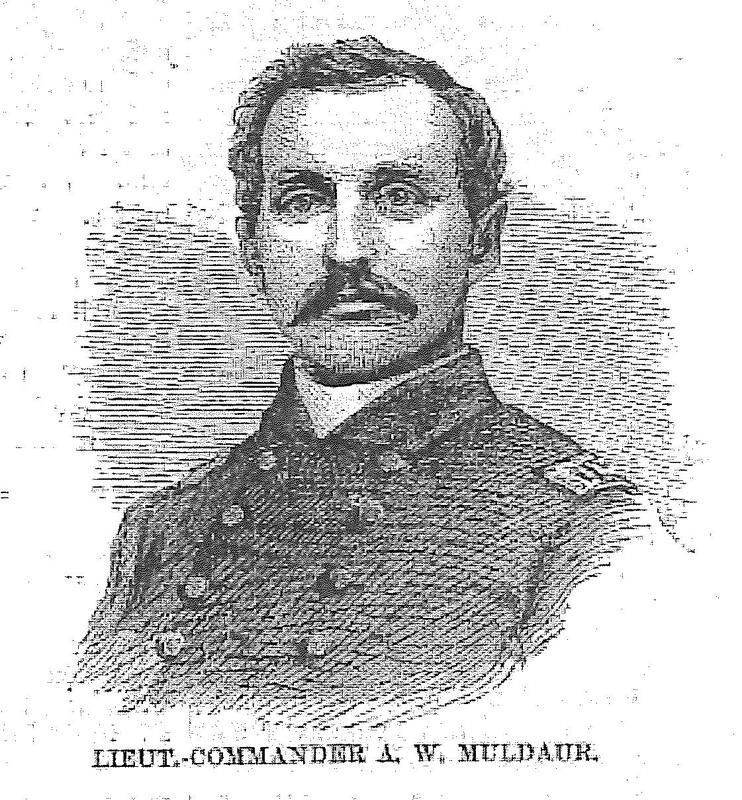 Muldaur ordered the course resumed, and joined Frothingham, Copp and the rest at dinner. Bombay drew closer. Inexplicably, she seemed to be recklessly attempting to round Oneida and get on her port side, in between Oneida and the western shore. With only a few feet between the ships, Yates ordered helm hard starboard. For the briefest of moments, it seemed the steamer would go around Oneida’s stern. It was not to be. 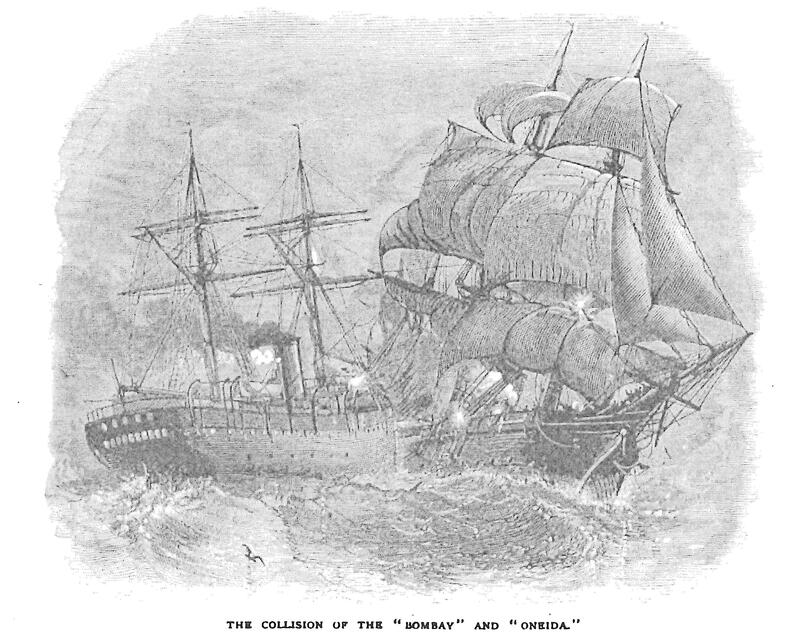 On January 23, 1870, at 6:50 PM, the Peninsular and Orient steamship Bombay collided with the USS Oneida. Bombay’s iron hull sliced off the entire rear quarter of Oneida just aft of her mizzen chains. Steaming away into the distance, Bombay carried with her Oneida’s spanker book and gaff. In the steamer’s guest dining room, two female passengers barely felt the collision, looked up momentarily, then resumed their game of bezique. Frothingham, Copp, and their fellow officers, relaxing in the wardroom with the solid contentment of men who’d enjoyed a good meal; in mere seconds the hull of the ship came bodily across the dinner table with a sickening sound of crushing timber and shrieking metal. 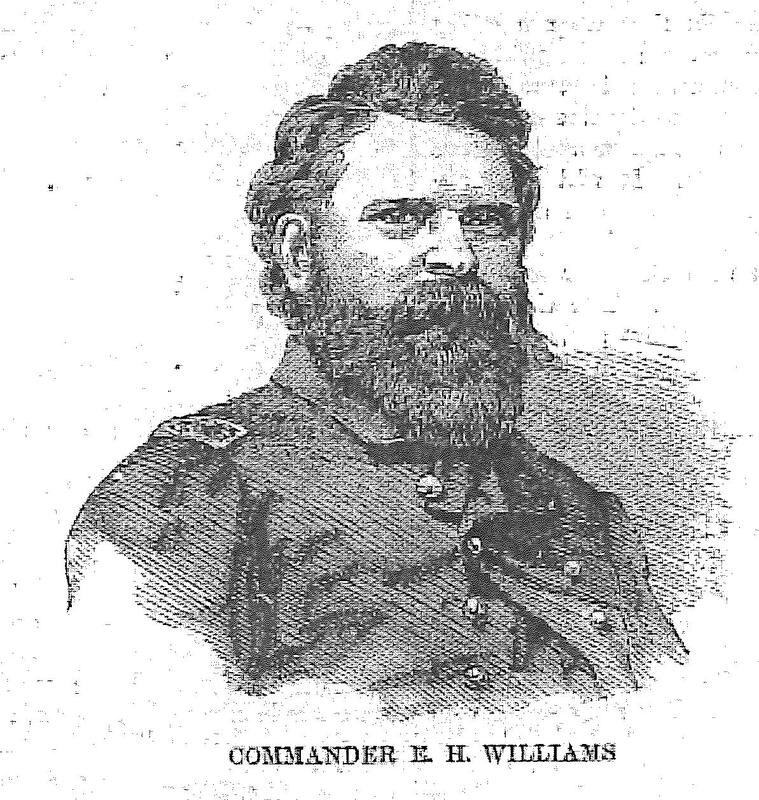 In his cabin, the crash knocked Captain Williams to the floor. Crowninshield, moments before asleep in the transom, fell to the deck, stunned. As his head cleared, he stared, mouth gaping. Where before there had been the ship’s hull, know he looked out at the sea and stars. On deck, Alfred Ruggert fell to his knees, aided by his grip on the weather wheel. Fortune favored him; he’d seen two of his crewmates sent overboard into the icy water.